FIS world cup cross-country, 10km women, Otepaa (EST). Photo Credit: www.nordicfocus.com. © Modica/NordicFocus. With a blistering trip around the skate sprint track in Otepaa, Estonia, Dahria Beatty is one step closer to becoming a full-fledged Canadian Olympian . 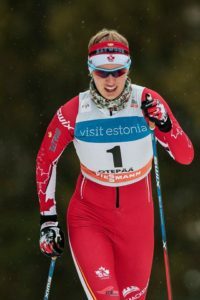 Beatty finished 29th in February 18th’s World Cup race for her third top-30 race of the season, meeting Cross Country Canada’s Olympic selection criteria. She qualified for the top 30 with a time of 3:02, eeking in to the heats by a mere 0.08 tenths of a second. At the end of the day, she moved up one spot to 29th to earn a trip to her first Winter Olympics. Stina Nilsson of Sweden won the race. “it is really exciting to be the first Canadian women to meet an Olympic nomination criteria for the 2018 Olympics. Representing Canada at the Olympics has been a dream I have been working towards most of my life and to be so close to that dreams now and to see it as a very probable reality is pretty amazing,” Beatty said. Canada won’t officially announce its Olympic team until next season, however Beatty is in the driver’s seat as the lone Canadian woman with top-30 results this season. The top-30 result is especially notable for Beatty as it follows a tough training camp in Davos, Switzerland. Beatty traditionally takes longer to recover, so the top result is a sign of more to come as world championships kick off this week. “Now she gets to enjoy racing. It sounds so dumb, but the pressure to qualify for South Korea is off,” Perras said. Beatty is the second AWCA athlete to meet selection criteria for the 2018 Winter Olympics in Pyeongchang, South Korea this season. Knute Johnsgaard met the mark earlier this year as part of Canada’s historic silver medal team relay result. Perras, an Olympic biathlete himself, said the results will have a cascading effect. “This changes the trajectory of their careers. It makes everyone buy in and give more weight to your results. Having self belief and self confidence is so integral. This doesn’t change the athlete you were the day before, but it’s a small reminder from where you’ve come,” Perras said. Consistent training and health have been two of the biggest factors for Beatty and Johnsgaard, Perras said. Health issues have plagued many of the Acadamy’s top senior athletes, including Patrick Stewart-Jones, Julien Locke, Maya McIsaac-Jones and Olivia Bouffard-Nesbitt. Bouffard-Nesbitt just ended her season with a neck injury. “For (Dahria and Knute), this is a result of staying healthy and training consistently. It’s more a product of the work they’ve done over their entire careers than what they’ve done in the past six months. It’s good for the younger athletes to watch how they train, and learn to be patient. Do the right work, stay healthy, and be there when opportunities arise. You have to be ready to make hay,” Perras said. World Championships begin Feb. 22 in Lahti, Finland. The sprint races will take place on Feb. 23rd, however Beatty plans to race nearly every event. “I am refocusing on what is right in front of me. I will be starting my first world champs race tomorrow. So far my first two days at world champs has been a great first experience and I am really looking forward to the next two weeks. I will be racing everything except the skiathlon,” Beatty said.